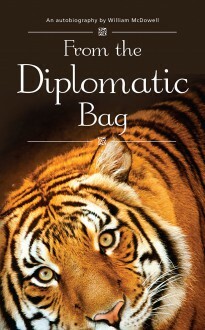 William McDowell’s life story: From the Diplomatic Bag, makes the kind of colourful tale that simply doesn’t happen in the modern world. Packed with adventure and excitement it tells of his life in India, the country of his birth. McDowell’s brushes with death began early in life. While still in his teens he was kidnapped by a group of tribesmen and kept prisoner for several days in a case of mistaken identity. On a canoe voyage down a swollen river he was flung from his canoe and dragged out of the water more dead than alive. He also narrowly survived a plane crash on a diplomatic mission. The sectarian turmoil during the partition of India McDowell witnessed involved many harrowing experiences. He saw a close friend decapitated by an angry mob of Muslim fanatics and had to deal with the aftermath of slaughters by extremist Muslims, which left scores of innocent people dead or horribly mutilated. On a less tragic note, there was the time McDowell unwittingly threw the president of the Punjabi National Congress out of a train after a dispute about the occupancy of a compartment, an event, which nearly cost him his career and his friend the Maharaja of Patiala once offered him the freedom of his harem, which he politely declined. Life did start to calm down a little after McDowell managed to shoot his own foot off on a pigeon-shooting trip, but the adventures were not over. When he was sent to the high passes of the Himalayas to find out where Russian refugees from the revolution were getting through, he was snowed in for three months. He survived only by killing and eating a hibernating black bear, which was sharing his cave.